This recipe probably needs a shorter name, but everything in its name is too delicious to be left out of the title. So, there it is in all it’s wordy glory. 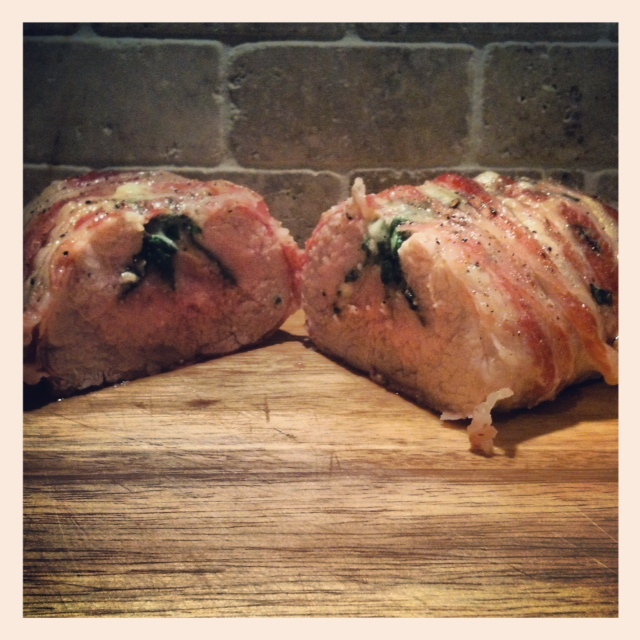 This is a somewhat lighter version of the bacon-wrapped tenderloin I made a while back. The pancetta, which is still basically a bacon, has much less salt than traditional American bacon. It serves several purposes in this application. First, it helps hold the tenderloin together after the stuffing has been placed inside without the clumsy use of a bunch of toothpicks. (I’ve made it with toothpicks as well…it’s not fun.) 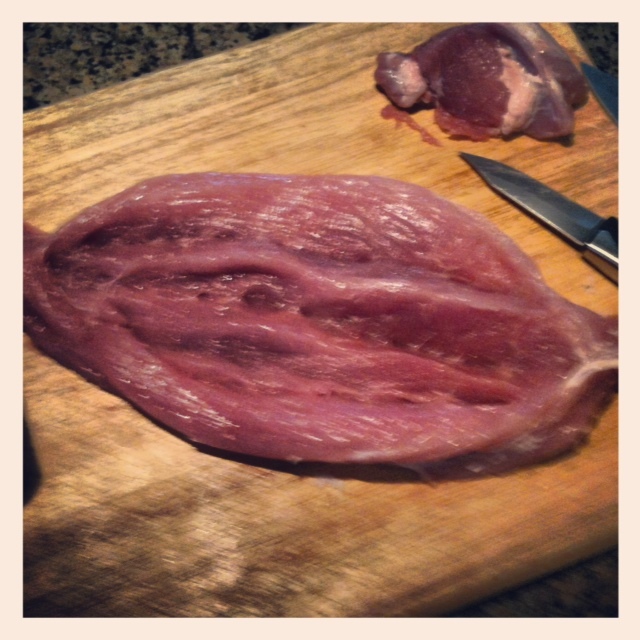 It also adds a little fat and a lot of flavor to a VERY lean piece of meat. As mentioned above, it cuts down the sodium content as compared to using bacon. In addition, this recipe adds some vegetables to the mix by stuffing the pork with fresh spinach. 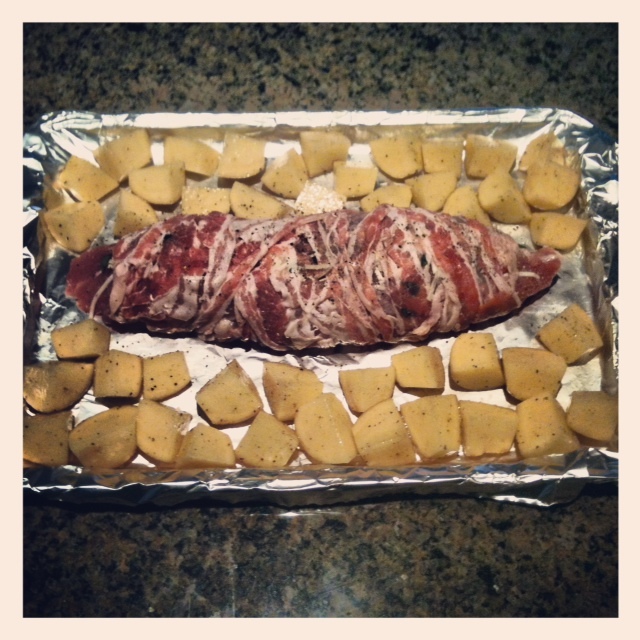 Note: The pictures for this recipe also include a side of my Easy Roasted Potatoes. These potatoes roast alongside the meat on the same baking dish so that they can soak up all the goodness that comes out of the pancetta and the pork. The full recipe is available by clicking the link above (or right here), but the basic concept is to cut up the potatoes, toss them with a little salt, pepper and olive oil, and place them on the baking sheet. No special timing required, just add them to the cooking sheet with the pork and cook the whole thing for the same period of time. Everything will be done at the same time. So, before this post gets a wordy as its title (probably a little late…), let’s get started! Preheat you oven to 400 degrees so that it can get good and hot while you are prepping the meat. In order to stuff the tenderloin, we will need to open it up. 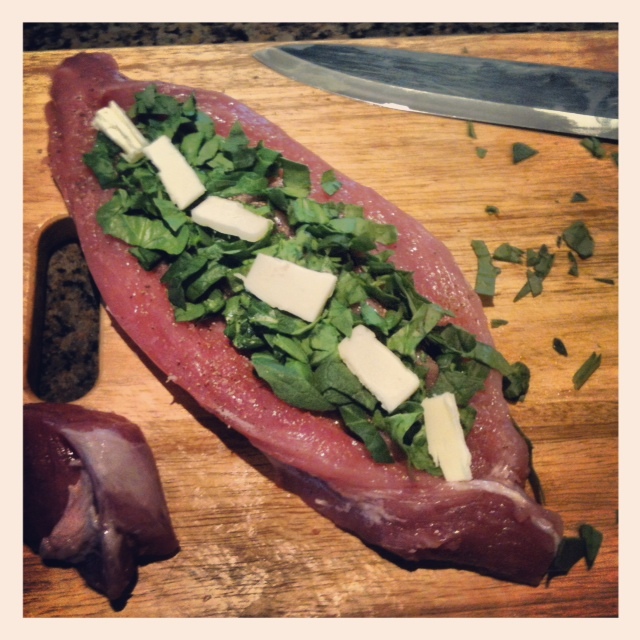 I prefer what I call the “three incision method” when stuffing a tenderloin. First, make an incision the length of the tenderloin that extends about 3/4 of the way through the thickness of the meat, and spread the tenderloin open. 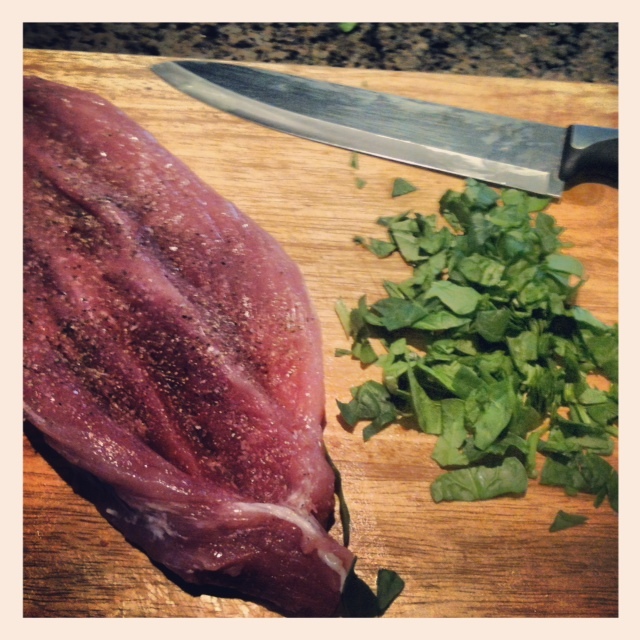 Next, make a similar incision into each of the sides, and again spread the meat open. Now roughly chop up the spinach leaves. 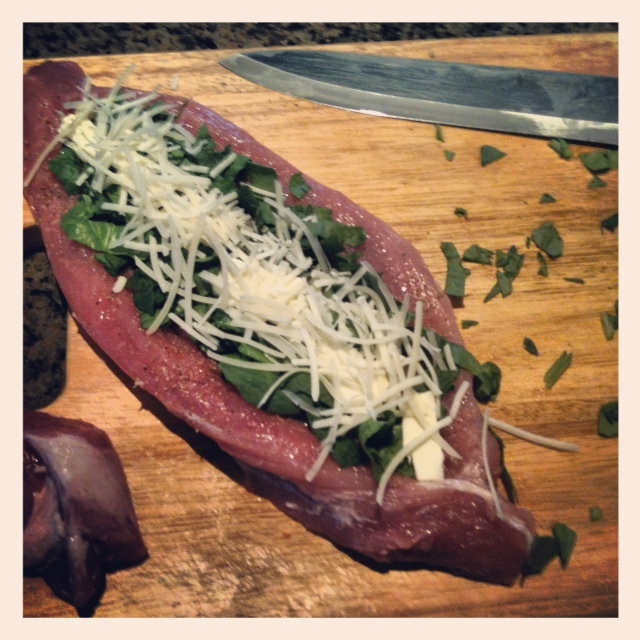 Next, add the spinach to the pork and top with a few small pads of butter. While we use very little butter here at Eats For All Ages, it really adds to the flavor of this dish and makes the spinach extra tasty. Top the spinach with a little of the shredded cheese. 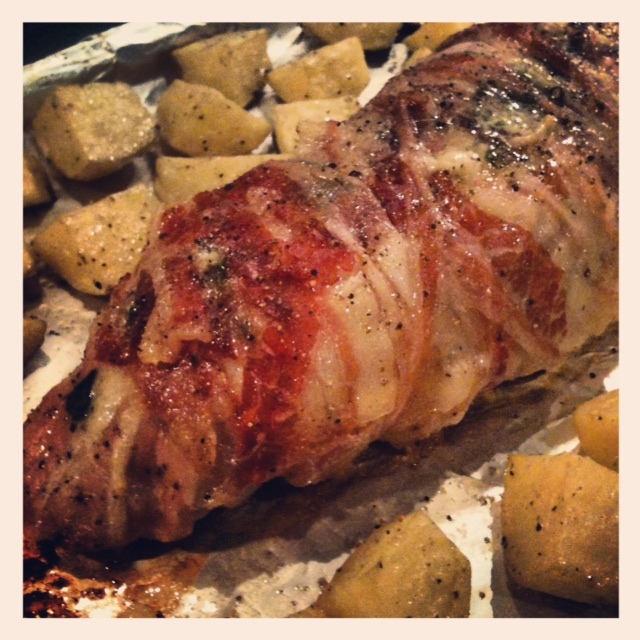 Gently fold the meat back around the stuffing, and wrap with the pancetta. 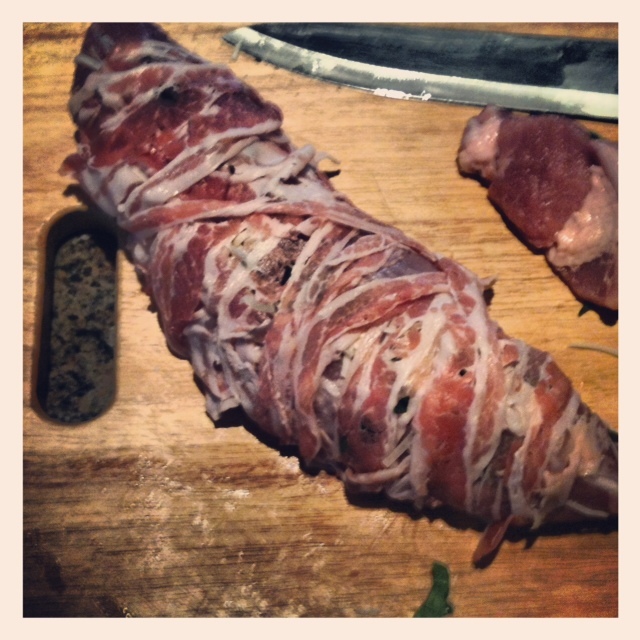 Use the tackiness of the pancetta to help get a relatively tight wrap. You don’t want the whole thing squeezed tight, but you want the stuff inside to stay inside. Place on a baking sheet (with or without a side of potatoes). Place in the oven, and roast at 400 degrees for about 30 minutes. The pancetta will crisp up some, but the fatty parts do not brown as much as American bacon, so it will still look somewhat “raw” when it is done, but this is normal (and delicious). 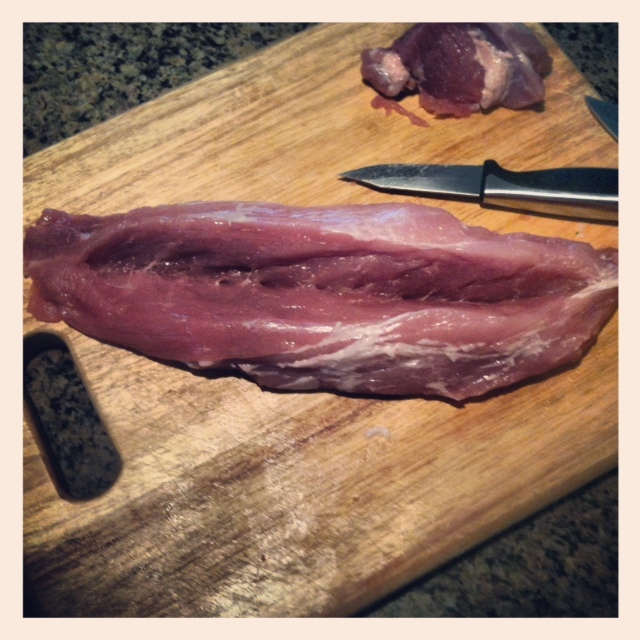 Let the meat rest on a cutting board for at least 5 minutes after it comes out to let the juices settle and distribute. 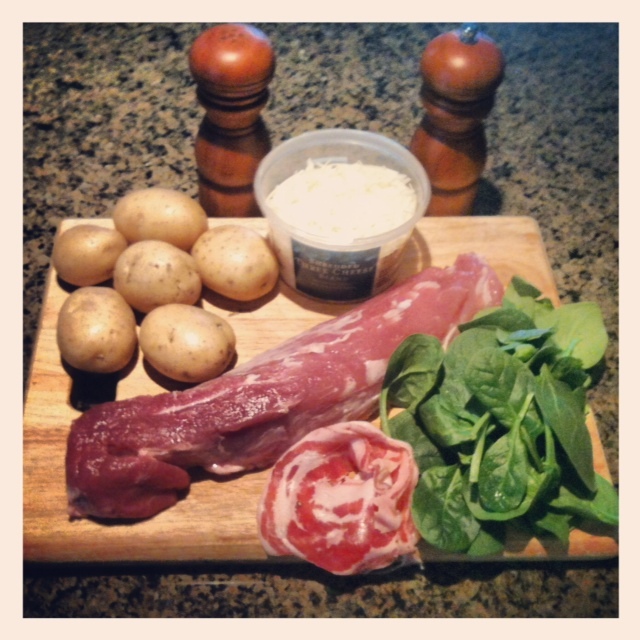 Then slice, serve and dig in! The little eater at Eats For All Ages was a big fan, and took down the spinach without even a second look. 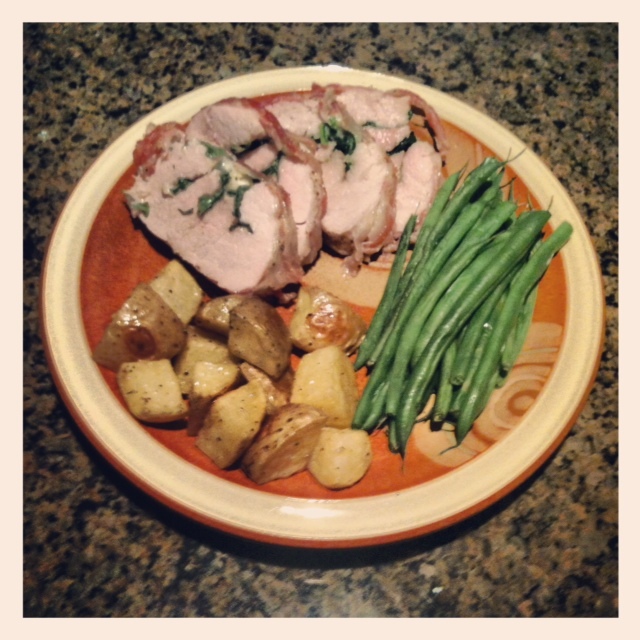 In addition to the roasted potatoes, I served the pork with a side of lightly steamed fresh green beans. The stuffing options are limitless here, so feel free to experiment with different flavors and combinations. And, as always, Enjoy!